Due to increased ‘online security risks’ in past few years, Firewall is a mandatory application/software these days, for everybody. When you’re using Ubuntu 11.10 (or any other Linux based operating system such as Debian, Linux Mint, openSUSE, Fedora etc) then you shouldn’t worry much about security because a packet filtering system called – ‘netfilter‘ is already there (shipped with Linux kernel) by default. iptables provides a complete suite of commands to configure/control each incoming/outgoing packets – thus it provides a highly flexible and powerful firewall solution. iptables has only command line interface (and it’s not so easy to become a Guru of iptables), which creates some difficulties for newbies who just want to use some basic features of it’s underlying packet filtering system (I mean – netfilter). That’s why there are lot of front end applications available with graphical user interface (GUI) for iptables, and it’s really very helpful for absolute beginners. 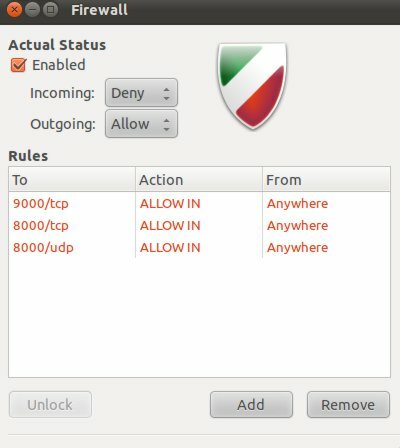 So this post is written for beginner users – who want to get started with Firewall on Ubuntu. Firewall configuration allows you to configure individual ports, common p2p, allow/block default ports for programs etc. 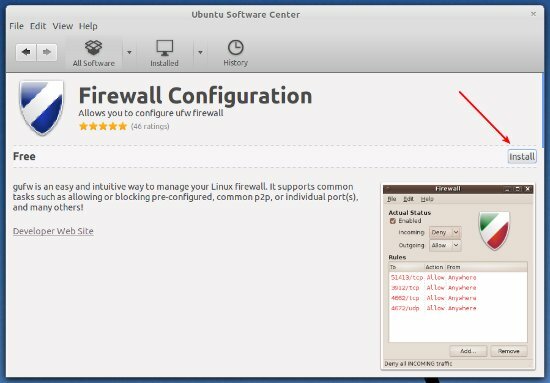 In Ubuntu, one such application is installed by default – named as – Uncomplicated Firewall (ufw). So all you need to do is to install its front end. gufw is the front end for ufw, it has very simple GUI with a lot of powerful features and it’s available in official package repository – you can install it in a click – from Ubuntu Software Center or by using a simple command. That’s all.. now you’re ready to play with the firewall. have Fun! Warning! The above application is intended for common users, so if you’re looking for a complete firewall solution for a server (running Ubuntu server edition or some other Linux distro such as CentOS or RedHat or…) then you should consider using iptables instead of ufw.